The International GLOBEC program has studies underway in several individual nations (http://www.globec.org/), as well as a joint international program in the Southern Ocean off Antarctica. modeling studies to integrate survey and process information in coupled physical-biological modeling frameworks, and move towards a capability to predict effects of different climate and oceanographic conditions on marine populations. 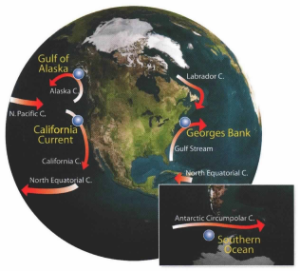 Two areas were also studied in the northeast Pacific Ocean — the northern part of the California Current off the Oregon coast, and the coastal Gulf of Alaska. Three salmon species were studied in the Pacific programs: coho, Chinook, and pink. Other important foundational species in these ecosystems were krill and copepod species similar to those on Georges Bank (cruise reports). The California Current program had active field activities from 1997-2003, with long-term observations, process studies, retrospective and modeling activities. The Coastal Gulf of Alaska program was active in the field between 1997 and 2004, and comprised similar activities (cruise reports). Over the course of the program, U.S. GLOBEC has produced an impressive body of research results, reported in close to 600 individual peer-reviewed publications to date (papers). In addition, numerous special issues of major scientific journals have highlighted U.S. GLOBEC research results (special issues).